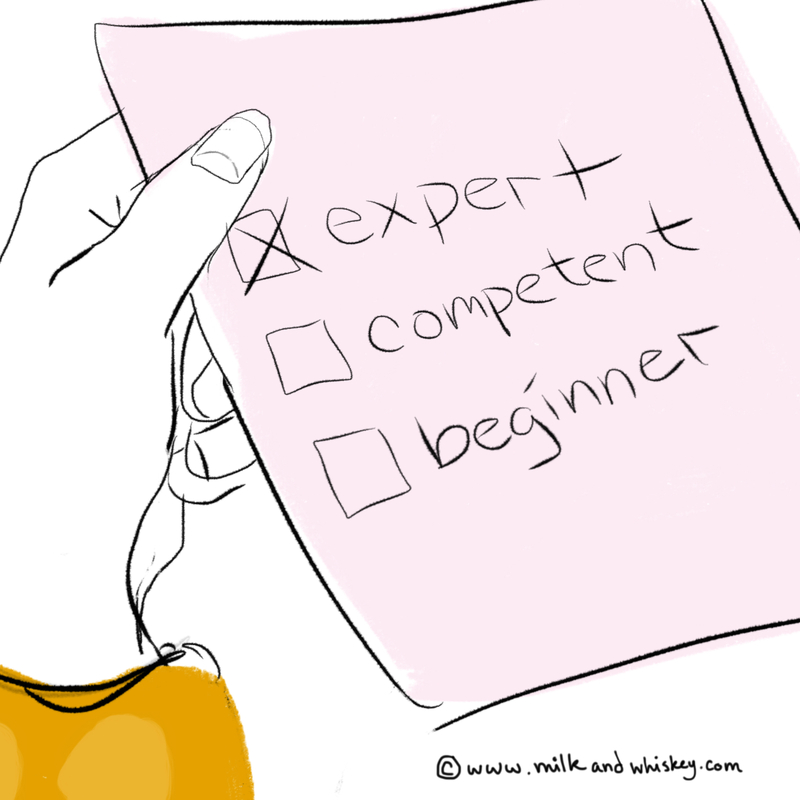 Nothing good starts with checking the “expert” box unless you’re actually an expert. My mother is NOT an expert on horseback. But that’s the box she checked. “Otherwise they give you some old nag,” she said. Considering that we were about to take a guided tour across serene Half Moon Bay beaches, I didn’t see how that would matter. I checked the next box down. Everything started off well enough as we mounted up and rode off behind a very nice gentleman who didn’t speak a word of English. A few hundred yards from the stable, we followed the guide down a steep, switchbacky trail onto the beach. 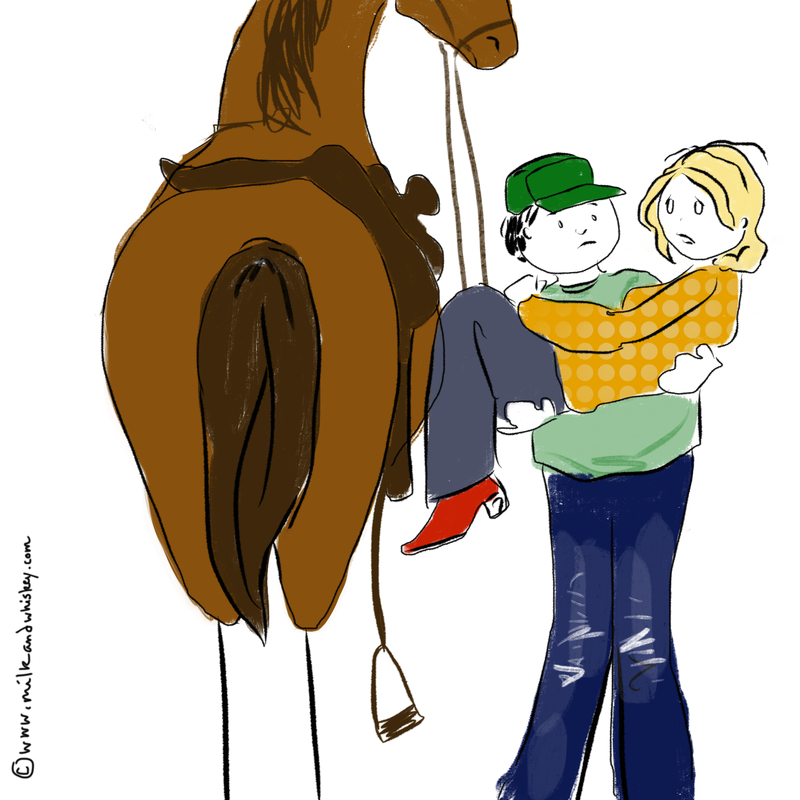 That’s when I noticed something was up with mom’s saddle. Two things happened simultaneously. First, our guide got an urgent call on his walkie-talkie, made some sounds and gestures at us that looked like, “wait here,” and then abandoned us. As soon as he was out of sight, mom’s horse saw his chance to make a break for freedom and leapt into a full gallop across the beach. I believe I mentioned that my mother is NOT an expert on horseback. Turns out, an excess of self-confidence doesn’t do much to stop a horse at full gallop. Especially when the girth on your saddle is loose. I’m not an expert on horseback either, but I do read a lot of fantasy novels. 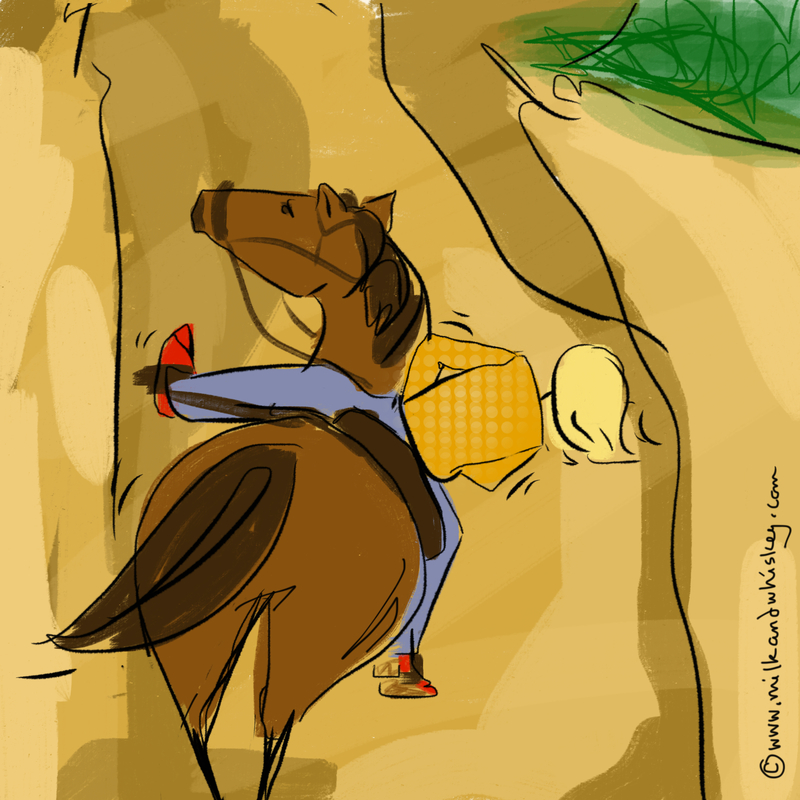 So I kicked my horse into high gear and pounded after my mom, who was sliding – ever so slowly – sideways in the saddle. The horse took a sharp right and ran straight UP a f’ing cliff. Like Spiderman. If Spiderman was a horse. Mom, meanwhile, was now riding parallel with the ground. Her head was inches from the walls of the cliff as spiderhorse ran up it. The fact that she was still attached to the horse at all defied physics. Maybe it was all those hours with the Thighmaster, maybe it was the strength of fear. Spiderhorse, thank God, stopped at the top of the cliff, and ran right smack into our guide who was helping some other poor soul. The look on the guide’s face, when he saw my mother, sideways on a sweaty, panting horse, was pretty damned priceless. He moved with remarkable speed, too, catching her before she completed what had to be the world’s slowest fall from a horse. Tightlipped, he led us back to the stables. We drove back down into the valley, where we belonged. That is the last time either of us has been on a horse. When she moves up here, next year, I think we should take another run at it. Ask MILK about the time she got caught in a forest fire while on horseback.